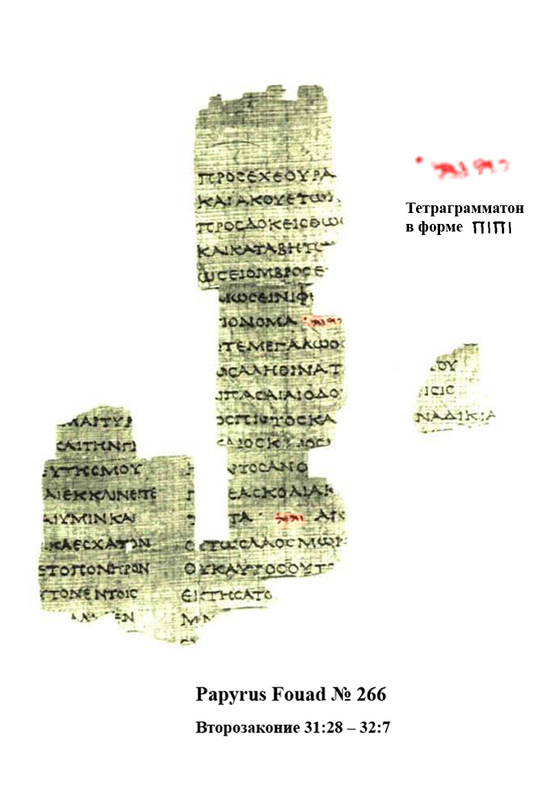 A fragment of the Septuagint in which the Tetragrammaton appears. JW: Good because I want to talk about the name of God one more time. My witness friend brought his study edition of the New World Translation this time. There were some things he wanted to show me last week, but he didn’t have his study edition Bible which discusses a bunch of different topics in the many appendices. Appendix 1D is titled, “The Divine Name in the Christian Greek Scriptures.” This title is deceptive because the Watchtower refers to the New Testament as “The Christian Greek Scriptures,” yet the appendix speaks about the Septuagint. For those who are unfamiliar with the Septuagint (referred to as the LXX), it is the Greek translation of the Old Testament which was used in Jesus’ day. (To learn more about the Septuagint, read here) My friend read a paragraph which he thought was important. Concerning the use of the Tetragrammaton in the Christian Greek Scriptures, George Howard of the University of Georgia wrote in Journal of Biblical Literature, Vol. 96, 1977, p. 63: ‘Recent discoveries in Egypt and the Judean Desert allow us to see first hand the use of God’s name in pre-Christian times. These discoveries are significant for N[ew] T[estament] studies in that they form a literary analogy with the earliest Christian documents and may explain how NT authors used the divine name. In the following pages we will set forth a theory that the divine name, יהוה (and possibly abbreviations of it), was originally written in the NT quotations of and allusions to the O[ld] T[estament] and that in the course of time it was replaced mainly with the surrogate κς [abbreviation for Ky′ri·os, ‘Lord’]. This removal of the Tetragram[maton], in our view, created a confusion in the minds of early Gentile Christians about the relationship between the ‘Lord God’ and the ‘Lord Christ’ which is reflected in the MS tradition of the NT text itself. So in the first translations in Greek, they DID have the Tetragrammaton in it. KW: We don’t know that. The guy the Watchtower quotes says it is only a theory, but the Watchtower doesn’t think it is a theory. JW: We do have manuscripts that have it though. KW: But those are from the Septuagint. Do you know what the Septuagint is? KW: It is the Greek translation of the Old Testament. (Pointing to the picture) This is referring to the Old Testament, not the New Testament. JW: But this is part of the New Testament. KW: No, the Septuagint is only the Old Testament. See here? The caption for the photo says it is a fragment of Deuteronomy 32. JW: Ok, the idea is that God’s name was still in use at that time. See here where the Tetragrammaton appears in the Greek? KW: Those look like smudges to me and Greek ones at that. My buddy wanted me to search for a bunch of stuff on my iPad and we did a little research right there in the restaurant. He was looking up some of the references in the appendix and wasn’t finding what he wanted. He is quite handy with Google which could end up biting him down the road. Who knows what he will have the courage to look up as we continue to meet? He again reiterated that the Divine Name was used in the first century and made mention of Romans 10:13. I wanted to go there, but before we did, I wanted to set the stage first because Romans 10:13 is devastating to the Watchtower idea about inserting the name Jehovah into New Testament passages which quote the Old Testament. He stopped bringing his Kingdom Interlinear Translation (KIT) months ago because every time he brought it, it did more damage to his argument than it helped. I wanted to remind him that he needs to look up this passage in the KIT. KW: Sure. I’ve got no argument with that. If the Tetragrammaton was used in the Old Testament then it needs to be there. If it was in the Septuagint, then it needs to be translated that way in the Septuagint. But if it is not used in the New Testament, then we shouldn’t insert it. I want to be consistent. Do you have your Greek Bible with you? KW: No? You should have brought that with you if you wanted to look at original languages. What was that verse you wanted me to look up again? JW: Romans 10:13. It says, “For everyone who calls on the name of Jehovah will be saved.” It is a quote from Joel 2:32 which contains the name of God. The question is, why was it taken out? KW: You are assuming that it was there. KW: We don’t have any manuscript evidence. We only have evidence for the Old Testament, but we don’t have any for the New Testament. There was well over 30 seconds of silence before my friend spoke up and wanted me to search Google images for LXX. He was trying to find the same picture online which appears in the appendix 1C of the study edition of the New World Translation. We found what may be the same picture, but we cannot be certain. KW: I really don’t understand why this issue is so important to you. I’ve told you that I know the name, use the name, teach it to my kids and even sing worship songs which include the name. I don’t know… Why don’t you show me that thing in Romans 10:13 that you wanted to point out. JW: Can you read it out of your translation? JW: What does it say in Joel 2:32? JW: See we believe that the name, “Jehovah” was taken out of the New Testament because Romans 10:13 is a quotation of Joel 2:32. If the Tetragrammaton appears in the Old Testament, like it does here in Joel 2:32, then we can rightfully restore it here in Romans 10:13. JW: If the name was there, who are we to take it out? JW: But if it was taken out, then we have the right to restore it. KW: You can’t say it was taken out unless you can demonstrate it and the only way to do that is to have an example of the Divine Name in a New Testament Greek manuscript. If there are New Testament manuscripts that have the Tetragrammaton in it, wonderful. But if not, then it needs to be translated faithfully. I can’t insert a name that isn’t there. If the manuscripts have the word “Lord” in Romans 10:13, then it should be translated as “Lord.” Then we must deal with whatever the text says doctrinally. From my perspective it looks like the name “Jehovah” was put in there because your translators don’t like what it says about Jesus. My friend ignored that comment and again talked about the Old Testament and how most modern Bible translators take out the name of God. KW: I agree with you and I don’t like that. I really wish our Bibles today included some version of God’s name, “Jehovah” or “Yahweh” or whatever else instead of “God” or “Lord.” But at the same time I do not want to insert Jehovah into the New Testament if the original writers wrote “Lord.” I don’t have the authority to change Scripture. If I am going to change it, I need to have a really good reason for it. I need facts, not a bunch of theories. I need to see some manuscripts that actually say, “Jehovah.” If they don’t say “Jehovah”, then I am guilty in the New Testament of exactly what I condemn in the Old Testament. I don’t want to be a hypocrite. KW: That is because you are not making a big deal about the name “Jesus.” If you were claiming that I had to use the English pronunciation of “Jesus,” I’d be making the same argument. I’d say, “No we don’t. There isn’t a “J” Sound in the Hebrew language. KW: Again, you are assuming they took it out of the New Testament. I can’t make that assumption unless I have the evidence to back it up. JW: Okay. I’ll do some further research. KW: (Pointing to my iPad) It is a good thing this thing is charged up isn’t it? We both laughed and then finally opened the “Teach” book. Our next topic was completely unrelated and very detailed so I will end here. This post is already long enough. I will publish the rest of our conversation in the next couple of days. Please pray for my Jehovah’s Witness friend. I have heard this argument from Jehovah’s Witnesses many times. In reality, the pronunciation of God’s name in no way compares to God’s reputation. That is much more important. My aversion to using “Jehovah” as “God’s name” is because they keep claiming that my salvation depends whether or not I use the English pronunciation of it. They think they have a point when it comes to the English pronunciation of the word “Jesus,” but this is not an equal argument. If they insisted that I use the English pronunciation of “Jesus,” I would have an aversion to that as well. Is “Jehovah” the name of God? Absolutely not as it didn’t even exist until the 13th century. Is “Jesus” the name of the Son and does my salvation depend on my use of the English pronunciation of it? Equally ridiculous.